I live in a very liberal town. New York City. Super Storm Sandy, the 9-11 Attacks, all absorbed and overcome by the toughest, coolest people on Earth, the average New Yorker. When I get a chance to go abroad people want to confront me cause I’m a “yank”. The response? ”yank this, I’m from New York” instantly changes the conversation. Everyone has been or wants to come here. It’s a World City like London, Berlin, Amsterdam or Prague. If you went to Papua New Guinea and spoke to the average person you can bet they heard of New York. Hell, every disaster ever features a lone survivor in a New York Yankee cap (which is why I keep mine handy). If you live here and are intolerant your life will be sheer Hell. Everything would offend you. Glen Beck moved to some part of Teabagistan because he was SO intolerant people started to take offense at him constantly being offended and he became ostracized. That says a lot. Being intolerant is nearly an anathema here. Blatant bigotry is about the only way short of shoving people on the subway to get any reaction from a New Yorker. One of the things that enables this is a pretty damn good police force. Possibly the nations best. 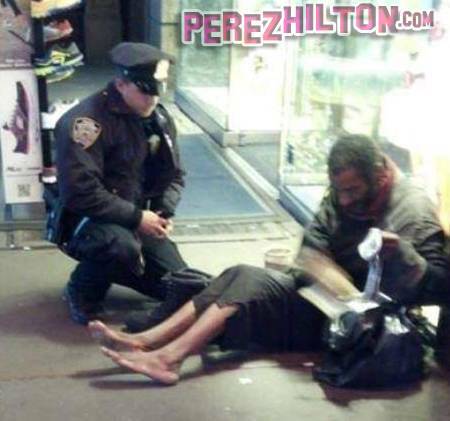 I was in no way surprised that a compassionate NYPD beat cop was moved to buy shoes and socks for a freezing homeless man. This story was oinly big news because the tourists who saw it never had seen that sort of Police behavior before. While not commonplace, its far from unheard of either.Sure there are definitely some awful policies like “Stop and Frisk” but they will also toss you in jail if you commit a Hate Crime In New Orleans their poorly regarded police force all fled the Unknown in the face of Hurricane Katrina. somewhat more well oiled than in most other cities. Just look at Los Angeles. They police hate the citizens and the citizens hate the police. Roughly every 10 years a major anti-police riot erupts due to lack of professional policing. So what’s my peeve? Well it’s Intolerant and ignorant people who live on the outskirts of New York and other parts of America where a major metropolis is too far away to exert any cultural influence. While there are still plenty of reasonable exurbanites the intolerant ones have the biggest mouths. They are all over Social Media. They have no agenda, they simply are intolerant. So intolerant and frightened that I have gotten used to being labeled gay simply because I endorse the right for everyone to do whatever they want in a darkened room with a willing partner. Hey, it’s not my thing but I will defend this right to the end. Not because I am gay, which I am not, but because I just HATE small minded people. Unreasonable fears that being gay or smoking weed or whatever is somehow a contagious and dangerous plague and they are destined to be accosted by gay folk who are intolerant. Aside from the self despising Log Cabin Republicans by and large gay people are pretty reasonable. New York doesn’t generate gay people, nature does that. It merely attracts people who have been discriminated against because it’s known as a tolerant place. After being discriminated against most people tend to hate and avoid becoming intolerant themselves. Then there are people walking around with tattoos from Leviticus condemning homosexuality. 2 verses later it says tattoos are a mortal sin. Selective readingof the Bible and selective reading of the Constitution and Bible are backed up by schools filled with semi qualified core of teachers and a mass of permanent subs don’t really inspire the best learning and the first casualty is the Analytical Skills we need to truly understand the world. For example- 9 hours to maybe get a chance to vote? THAT’S what you get as an American Citizen? My hurricane ravaged city had all votes counted by 2 am. This despite a complete lack of basic utilities like electricity. Somehow Florida managed to finish just about a week ago. Is there any doubt that the small minded governor and his inhuman Cylon supporters are more concerned that the presidential election is going to be decided by a guy THEY chose beforehand….again. The reason again is Intolerance. Fear of ex Republicans Cubans as well as moderate thinking voters from the Caribbean, Mexico and pretty much anywhere else where people fulfilled their dream of being one of the best, an American. Enter the Tea Party and their insipid poison. Hateful policies that included idiocy so bad that Christian Slater, who must have done 20 feature films, was not recognized even with all his ID. This is willful ignorance. Recently Slater received word his ballot was rejected. It’s in no way a coincidence that the Board of Elections, whose complex ballots, which allegedly take 45 minutes to certify rejected the ballot because the idiot reading it mistook his signature as reading “Christiana DiSilva”. Not disgusted yet? Read on. Why? Because tolerance is spreading. The granting of rights to the LGBT community are not an offensive idea to most Americans. People have seen that this is no threat to any other kind of marriage. The Tea Bagger talking points ring hollow. Their lies and misinformation could only be maintained for so long. The truth confronted people every day. Truths like that life was alittle worse every one of those miserable 8 years when future failed presidential candidate and then Governor Jeb Bush threw their votes away and made his dimwitted brother president despite being soundly defeated. The wars and the recession that has been a hallmark of both George H.W. Bush and the completely incompetent George W Bush administrations didn’t help the world to be a better place. Later it was proven that no invasions were EVER necessary. It was stoking the flames of intolerance that ignited by the preventable 9-11 Attacks. These people are old and their sick ideas will die with them.